Hello! I am sharing a new Fat Quarter Shop quilt along that I've been working on. 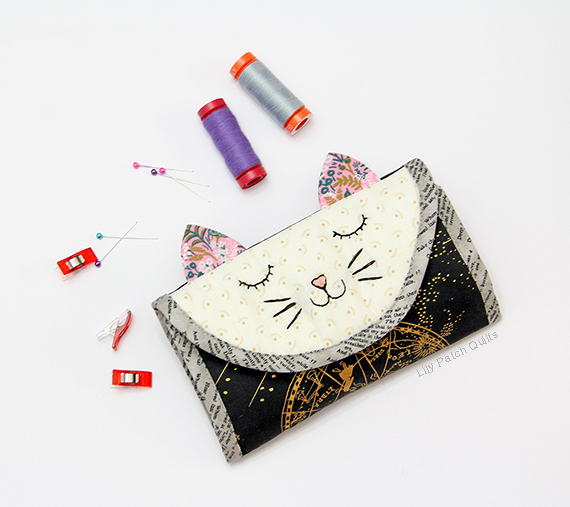 This is called the Kitty Caddy Clutch and it is a fun project to work on. You can get the free pattern here. I made this for my DD so she picked out the fabrics and did the embroidery for me. I had to put her to work since this is going to be hers. This caddy didn't take long to put together. 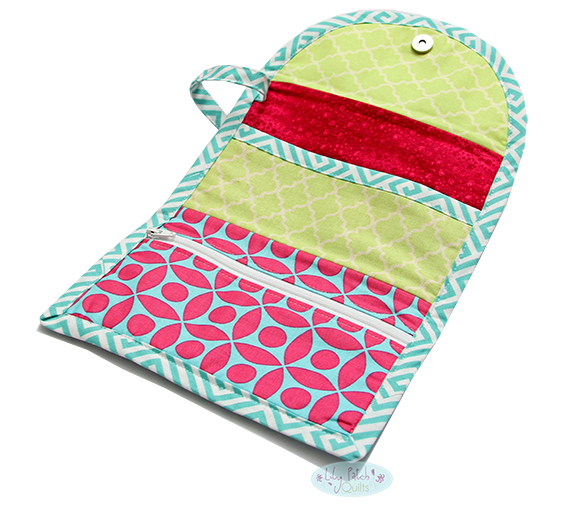 I did customize one of the interior pockets and kept it all one long opening. There were no instructions directly in the pattern for the binding, it directs you to the FQS's tutorial. I cut my strips at 1 3/4" on the bias and did it the old fashioned way. This is the interior of the caddy. DD wanted a bit of color for the pockets so she chose this beautiful Rifle Paper Co. print. 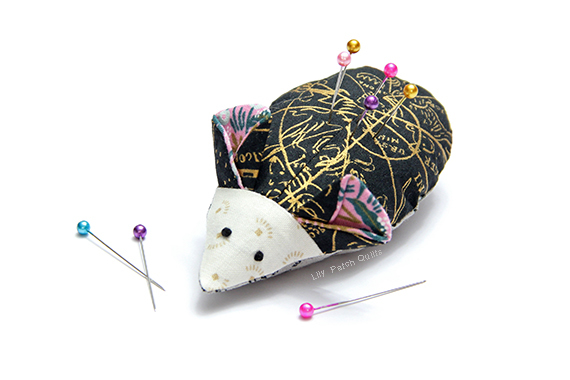 The mouse pincushion did not have instructions in the pattern. It directs you to the FQS's YouTube tutorial which you can find here which was not available when I worked on mine. I felt it best to not have the tail attached to the caddy so it can double as a wallet. Overall I find this pattern would be good for an intermediate sewer or confident beginner. I love that the diagrams were in color. The cutting size for the long exterior piece needs to be cut 1/2" longer to allow for the extra length from the interior zipper pocket. The pattern does state to trim if necessary to even out the bottom edges. 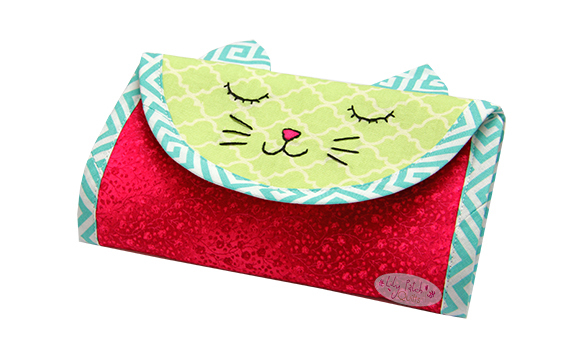 I don't know if it's my printer, but the pattern for the kitty (flap) came out 1/2" narrower than the width of the rest of the pattern pieces so I had to trim down all the pieces 1/2". If you do make this caddy, be sure to check your measurements for the kitty section before cutting the rest of the pieces. I really think that this is a great pattern to make and would be fun to carry small notions and sewing supplies. It would even make a nice size wallet. BTW, I cut the excess binding in half to make the zipper pull. I stitched about 1" down the middle to hold it together. Both of those kitty bags are too cute! Brilliant idea!! 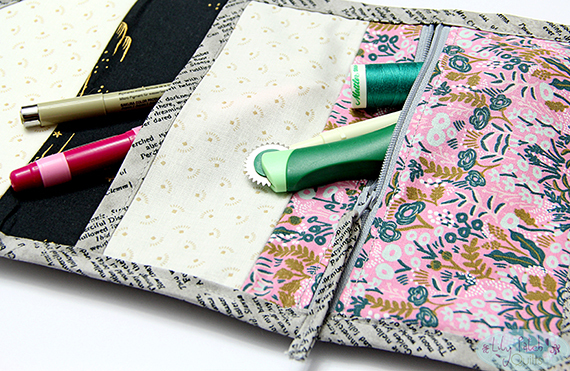 I never thought to use leftover binding as a zipper pull. Thanks for sharing! Adorable bags! thanks for sharing as part of the Elm Street Quilts Bag It event. Sew very cute. These would make nice gifts. Love your take on the pattern! Like you, I don't think I'll attach the mouse to the clutch.